Guided tours of the empty reservoir behind Elwha Dam near Port Angeles will be offered on Saturdays beginning Aug. 3 and continuing through Sept. 7. The Elwha River flows through what had been the Lake Aldwell reservoir, fully drained after removal of the Elwha Dam. Rangers from Olympic National Park will lead the tours and talk about the massive dam-removal project. This will be a wonderful service for visitors who wish to get up close and understand one of the largest ecosystem-restoration projects in the world. Instead of wandering aimlessly in what many would consider a wasteland, visitors will gain an appreciation for the shifting and eroding sediments and understand how the gravel is moving as the river reclaims its channel. They will view newly established vegetation and hear what it takes to restore native species to the area. They will stand alongside the mighty stumps of old-growth trees buried within the lakebed until the sediments began washing away. The hour-long walks will begin at 1 p.m., leaving from the boat launch at the end of Lake Aldwell Road. Turn off Highway 101 just west of the Elwha River Bridge. Explorers should wear boots or sturdy walking shoes and plan for windy conditions with no shade. For information, contact the Elwha Ranger Station, (360) 452-9191. 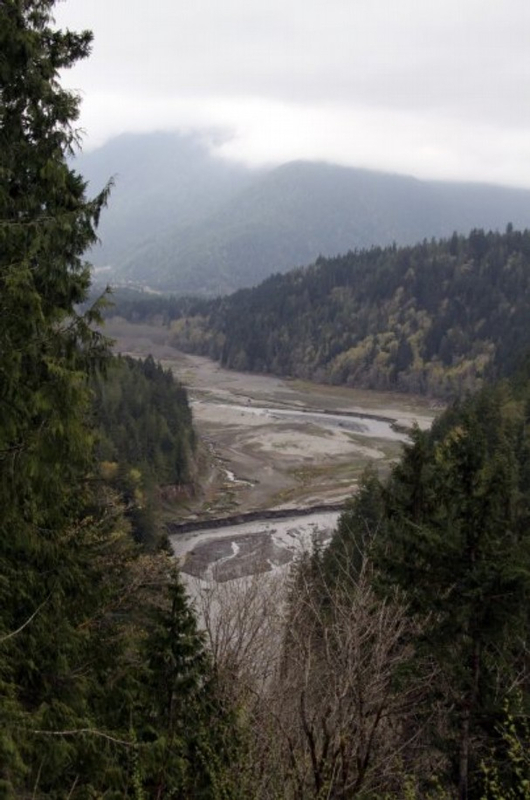 Earlier this year, I wrote a story for visitors interested in the Elwha restoration. Given that the tours of Lake Aldwell will last about an hour, you may wish to visit some of the other viewpoints while you’re there. See “Visiting the Elwha: Explore a River Transformed.” Also, check out a few of my observations in Water Ways, April 30, 2013. Meanwhile, officials at Olympic National Park posted a new entry to the Dam Removal Blog yesterday. It describes how aerial surveys are being used to measure changes in the sediments during this period of low flows on the river. The entry also discusses the revegetation effort, pointing out that sediments along the river are drying out faster this year than last.